Bipartisan talks over raising the debt ceiling resumed this week. And it seems increasingly likely that they will produce a deal that includes at least some cuts to Medicare. The biggest hint yet came on Tuesday, when Senate Democrats held a press conference. Charles Schumer, of New York, announced that his caucus opposed reductions in "Medicare benefits." But other kinds of Medicare cuts? Those he wouldn’t rule out. the health care entitlement area is extremely complex in terms of payment systems, reimbursement systems, delivery incentives, disincentives, and the rest. There is plenty of room for savings and accomplishment of efficiency in these programs. So anyone saying that they can't see anywhere that you can make these government programs more efficient, I just disagree with. And I see the numbers in these discussions. There's room for us to agree on trillions of dollars of savings. Although Schumer is not inside the bipartisan talks, he speaks for his caucus. And, in this case, he happens to be speaking the truth. Strictly as a matter of policy, enacting further reductions in Medicare spending isn’t such a bad idea. It is actually a good idea, if the cuts are properly structured and if they are part of a broader package that reduces deficits in a smart, balanced way. I know, that’s a lot of “ifs.” Let me run through them, because I suspect the subject is going to generate a lot of discussion in the coming weeks. To repeat something many of us have been saying for a while, Medicare cuts come in many shapes and sizes. 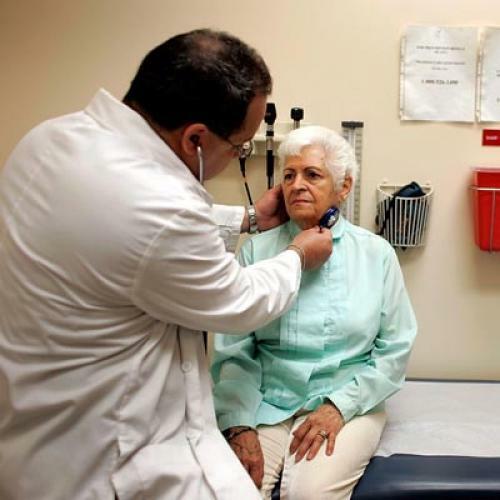 The Republican approach is to cut Medicare in ways that would truly decimate it. They would end the government insurance program, which guarantees that all seniors get a set of basic benefits. They would also reduce the program’s funding dramatically, to the point where typical seniors by 2030 would be individually responsible for about two-thirds of their medical costs. Most likely, wealthy seniors would respond by purchasing supplemental coverage, enough to insulate them from serious medical costs. Non-wealthy seniors wouldn’t have that option, leaving them far less able (and, in many cases, simply unable) to pay their medical bills. Critics say this transformation is tantamount to ending the Medicare program, at least as we know it. These critics are absolutely right. An alternative approach to cutting Medicare is to do so more delicately -- to change the way Medicare pays for services, to reduce the program’s spending gradually over time, and to keep in place the basic guarantees of benefits for all seniors. This is what the Affordable Care Act does. Under the law’s terms, the program eliminates corporate welfare for insurance companies and then proceeds to rewrite some of the formulas for paying the providers and producers of care, in ways that should foster more efficiency. The Affordable Care Act also imposes a cap on Medicare expenditures, effective a few years from now, although it's less rigid and far less severe than the one Republicans would impose with their vouchers. In short, these cuts won’t wreck Medicare. They will modify it in ways that will not affect beneficiaries, at least directly. But will these cuts modify Medicare enough? That’s a lot less certain. Many experts (including the Congressional Budget Office) believe that the Affordable Care Act will slow down Medicare spending by a little bit, when what we need to do is slow down Medicare spending by a lot. If these experts are correct, then further cuts to Medicare make sense, as long as they take the same essential approach as the Affordable Care Act does. One possibility would be to pursue changes that private sector lobbying kept out of the final health care legislation, like applying more pricing pressure on drug companies. Another possibility would be tighten that loose cap on Medicare spending. The hope, again, would be to reduce health care waste rather than reduce access or quality of care. Both of these ideas, not coincidentally, were part of the deficit reduction framework Obama formally proposed in April. And they are presumably the sort of cuts that Schumer had in mind during that press conference on Tuesday. But there's still a catch. By endorsing further cuts to Medicare, Democrats could blur the distinctions between the parties, relinquishing some of their political advantage on the issue. (Jonathan Chait discusses this possibility at his blog.) I don’t think that’s a reason to stay away from Medicare cuts. I do think it’s a reason to demand Republicans give up something in return. The outlines of a bargain here are pretty simple: If the final budget deal is going to contain Medicare cuts, then it should contain tax increases too. Otherwise, the deal makes no sense, as politics or as policy. Update: Apparently top Senate Democrats sent a formal letter to Minority Leader Mitch McConnell on Thursday, reiterating what Schumer said on Tuesday. Jennifer Haberkorn has the story in Politico.